This last month we had two young men come forward and ask to be baptized. These two young men; Deat & Faurd, have both been Christians for about one year now. They both are also first generation Christians. It is rather easy in Thailand to get someone to pray or to be baptized. The decision is not from the Holy Spirit but comes from the persuasion of man. So, I try to teach them to follow the Holy Spirit’s leading when they make a decision for the Lord. I teach them from the Bible what baptism is and how important it is, but tell them to decide on their own when they are ready. They were baptized a couple weeks apart and each asked on their own accord. 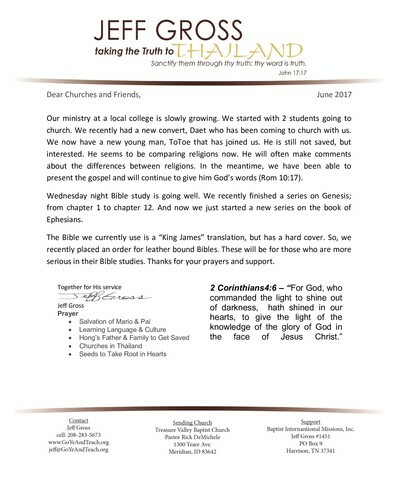 It is encouraging to see Thai young men making decisions for the Lord Jesus Christ. Deat and Faurd each gave a good testimony. We are currently working on a track from Adoniram Judson. After working in Burma and learning the language and culture he wrote a track about the eternal God. Adoniram believed the track would help the Burmese to better understand the God of the Bible. Thailand which is right next to Burma has similar beliefs. The track he wrote is also very applicable to Thais. We will use this track along with the Chick tracts that we already have in the Thai language. Thanks for prayers and support. Lord Bless. “And the things that thou hast heard of me among many witnesses, the same commit thou to faithful men, who shall be able to teach others also.” I’ve had several men ask if they can come and study the Bible regularly. The best time for them turned out to be Friday night. So, we started meeting on Fridays for Bible study. In addition, I have invited the college students to come as well. Our study has turned into a regular meeting. We have been meeting now for a couple of months. We have also had several non-Christians come to the study as well. I have started a new project; which entails translating seventeen short lessons. The seventeen study lessons are designed to give the child of God basic Bible doctrine. 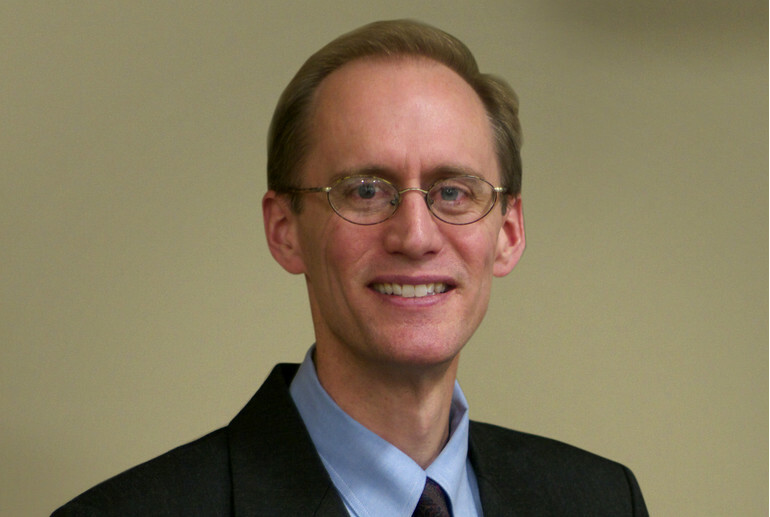 The studies range from salvation to the second coming of Christ. The main goal, of course; is to build a good foundation in God’s word (something that is greatly lacking here in Thailand). Eventually, these lessons will be used in church by mature Christians training new converts. They will also be used in the local villages. Thanks for your prayers and support. May the Lord Bless. The general thought here is that Jesus was a good teacher that started a religion. And all religions are good, because they teach people to do well. So, when they hear the truth of the word of God, they are a bit bewildered. In December we celebrate the birth of Christ and look forward to the return of Christ. Although we look forward to the return Christ many here don’t know about His first coming. Needless to say, December is a good month to teach about the birth of Jesus Christ and why He came to earth. So, we use this month as an opportunity to tell the gospel in places we normally wouldn’t have that option. Bible Baptist church put together a Christmas play designed to explain the true meaning of Christmas. We were allowed in four schools this year and one children’s home, ranging from 40 to 170 students. Praise the Lord for opportunities like this to present the gospel to so many students at one time. Most have very little idea of what we celebrate at Christmas. We also had a men’s outing this month. I was able to take 6 young men to a nearby mountain for a one night stay. We had a good time of prayer and fellowship. One of the young men(Tuey) is not a Christian. Bible Baptist Church in Chiang Mai is now 6 months old. The church is doing well. We had several visitors come this month. All lost, and each has come back for another visit as well. The general thought here is that Jesus was a good teacher that started a religion. And all religions are good, because they teach people to do well. So, when they hear the truth of the word of God, they are a bit bewildered. Many believe Christianity is a religion for westerners only. We know that the power of God is in the gospel of Christ. 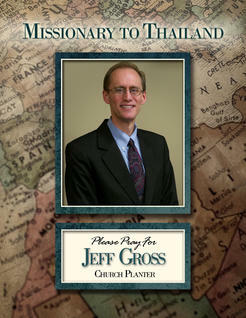 Therefore, our goal is to plant the seeds of the gospel and let the Holy Spirit work in their hearts. Praise the Lord for the opportunity to preach and teach the truth of the gospel. The university Christian group held a day camp for the students. Throughout the day there were scheduled Bible studies, games and meals. It was a good day of fellowship for the students. They invited me to do a lesson, and I taught on leadership characteristics of the Apostle Paul. We also had a men’s outing this month. I was able to take 6 young men to a nearby mountain for a one night stay. We had a good time of prayer and fellowship. One of the young men (Tuey) is not a Christian. Thank you for your sacrifice in this ministry. We were able to help start a church in the city of LamPhun, about an hour south of Chiang Mai. We helped Cornerstone Baptist Church for two years. However, our group from the university area is growing, and we are unable to continue to travel to LamPhun. The Lord has blessed our group and Cornerstone Baptist church in LamPhun is growing. 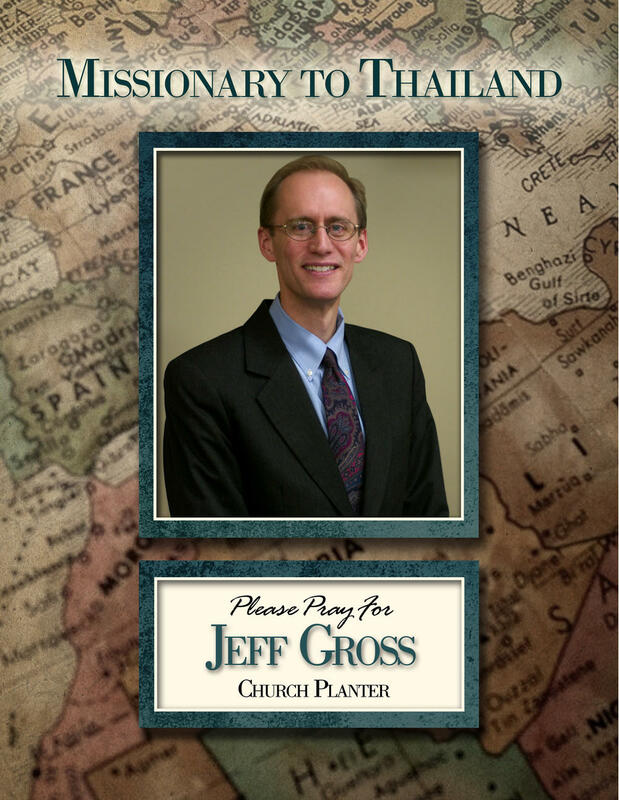 Therefore, we have decided to attend Bible Baptist Church in Chiang Mai instead. This Bible believing church is a church plant that has also just started. Our attendance has been a great blessing to the church. I have been preaching the Sunday morning message, and ask for your prayers that my language skills improve. On recent semester break from college, three of our recent converts were able to travel home. This was their first trip home since becoming Christians. All three experienced grief. All are first generation Christians in their homes. This becomes very difficult times for families. Family members are often fearful and confused at what it is to be a Christian. The opposition that comes from families is hard on a new Christian. It then becomes difficult for a new Christian to stay in church and grow spiritually. Pray that these three young men, ToToe, Daet, and Bluem don’t become too discouraged, but grow stronger in the Lord. Thanks for your prayers and support. They are greatly appreciated. Paul says in Corinthians that “there are many adversaries”. That is certainly the case here in Thailand. Spiritual oppression is very strong here and has been for hundreds of years. As a result, there is strong resilience against the word of God; however, there are open doors as well. And God’s word is always stronger than the opposition. Consequently, we were very pleased when we received our new leather bound Bibles. It was neat to see the smiles on the young men’s faces when they each received a nice gold-trimmed leather Bible. One of the young men recently saved, ToToe, asked to be baptized. This is encouraging because he asked to do this on his own. In Thailand, it is easy to influence someone to pray the sinner’s prayer or to get baptized… So, one needs to be very careful that the influence comes from the Lord and not from the missionary. After his request to be baptized, we did a study on baptism with the group. That way all had a better understanding of baptism. Christians here have very little teaching on even the most basic doctrines of the Bible. Consequently, I try to teach each doctrine carefully. Thanks for your prayers and support. May this be fruit to your account. baptize him, we plan to do a study on baptism so all understand what it means. 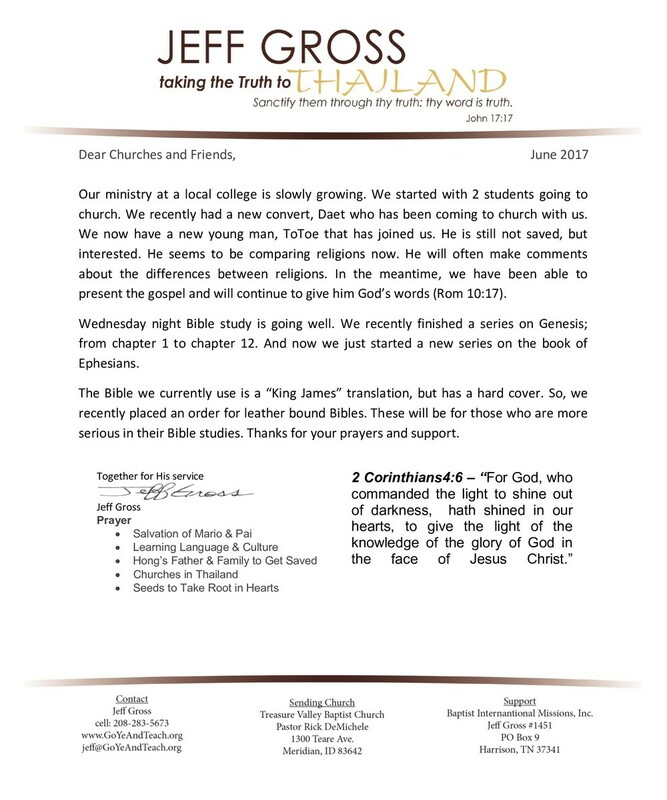 to introduce these Thai’s to our Lord Jesus Christ and to the church. Cornerstone Baptist Church held a special invitation day. We printed invitation cards and the church distributed them to friends and family members who do not normally attend services. We also invited old members who stopped attending for different reasons. Invitations work well in Thailand, and add a personal touch that Thai’s appreciate. Several new visitors attended, plus some lost family members. The message was centered on how Jesus died for our sins and rose again on the third day. Following the service, we catered a lunch for everyone and a good time of fellowship was had by all. One of the young men I have been working with at the college led another student to the Lord. This was his first convert. My friend said that they talked about the bible for several hours, well into the night. This other student asked many questions and then accepted Jesus Christ as his saviour. My friends name is Sanya and the convert’s name is Daet. Daet has also come to church with us several times now. Sanya was thankful that we had had many Bible studies together. The studies helped him to answer the questions. We were both encouraged; but most important, it is a great victory for our Lord. Thank you for your prayers and support.